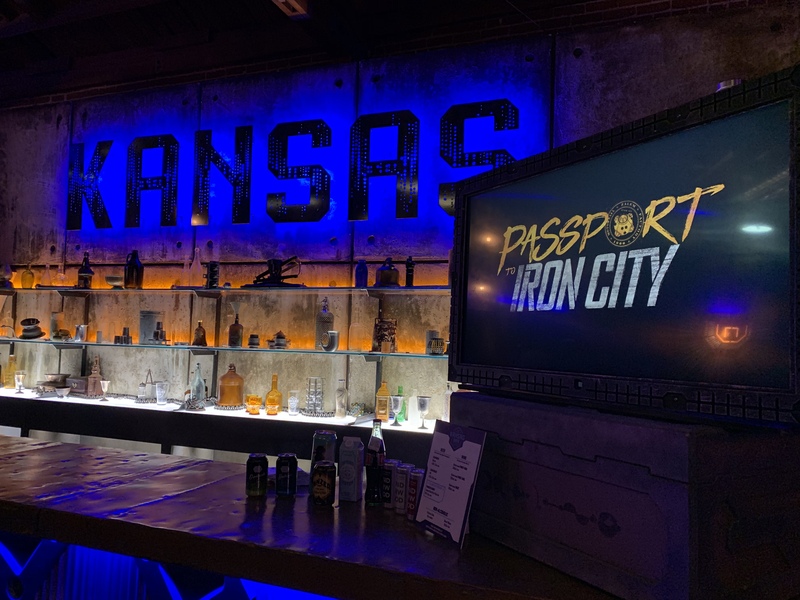 Stepping into “Passport to Iron City” I had no idea what to expect. It was described as an interactive experience and game, diving into the setting of the upcoming film “Alita: Battle Angel,” a post-apocalyptic world destroyed by a technological fall. It is based upon the manga series “Battle Angel Alita” released in 1990. The film, produced by visionaries Robert Rodriguez, James Cameron, and Jon Landau, creates a detailed, extensive universe that the experience is based upon. With futuristic technology, puzzles, and activities, it was like nothing I had ever seen before. After stepping through iron clad walls and doors, creating a unique badge, and receiving a team color, I walked into the exact replica of the Kansas bar, which included signature exclusive drinks unique to the event’s location (Los Angeles, New York, and Austin, Texas). There, we also met with our teams and learned that our main goal was to earn as many credits as possible. But how does a team earn credits? Through different activities set up in their 12,000 square foot space, participants can explore the Scrapyard, Chiron’s Lab, marketplaces, vibrant streets, marketplaces, Motorball Stadium, and many others. Puzzles and challenges are scattered everywhere, engaging almost all the senses. Buzzing neon lights, run-down pipes, eccentric characters from street vendors to Iron City lowlifes, and the large vintage-looking scoreboard posting each team’s credits encapsulate each player inside of an immersive world. Teams can attack a diverse set of games, from activities that test your brain as well as your sense of smell, touch, and sight. One has you guessing the contents of a jar by touch, another, identifying the rogue criminals in Iron City on surveillance cameras. By completing the challenges as fast as possible, teams rack up scores and even have a chance to bet their winnings on the Motorball race at the end of the 45-minute playing period. The winning team will walk away with a unique Iron city souvenir, and maybe even a ticket to Zalem, the only remaining sky city after the Great War. After the journey, each guest will receive a unique assessment of their gameplay, assigning them to an individually tailored role within Iron City. Even for those who haven’t read the manga or do not know anything about the film, the immersive atmosphere and attention to detail draws participants into a new intriguing world. Isolating this event from the film wouldn’t take away from the experience and definitely sparked my interest to see how the movie will unfold. The experience was put together by collaboration between creative production company iam8bit and media and entertainment firm The Seelig Group. Jon M. Gibson and Amanda White, co-owners of iam8bit, introduced the exhibit to the players. The production company works in many forms of entertainment, including video games, film, fashion, and music. With past productions for companies such as HBO, Nintendo, Playstation, Microsoft, Disney, and countless others, this experience was by far one of their most impressive creations. “Passport to Iron City” will open in Los Angeles on Jan. 23, in New York on Jan. 26, and in Austin on Jan. 29. ‘Early-bird’ tickets are available for $25, and will increase to $55 after Feb. 13. “Alita: Battle Angel” will premiere on Feb. 14, 2019.